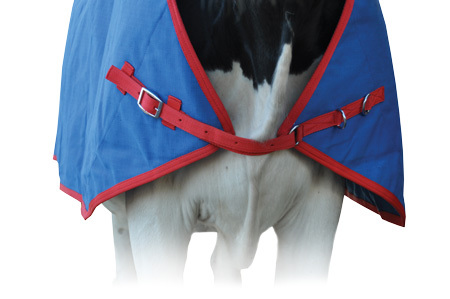 MIRoTEC Cow Coats are custom designed to to snugly fit adult cattle. The coats contain MIRoTEC material, with a durable wax canvas outer; lightweight, durable and weatherproof. Available in 3 adjustable sizes to fit cattle of both sexes. 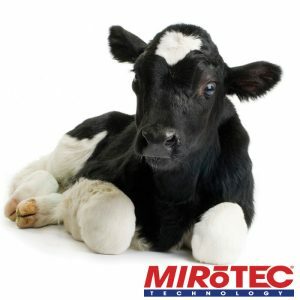 MIRoTEC Calf Coats are lightweight, durable and weatherproof. Designed to snugly fit the calf’s body to insulate against heat loss and prevent heat exchange into the surrounding cold air. Cows For any sick cow with a sub-normal temperature the MIRoTEC Cow Coat helps improve the chance of recovery from the primary illness. For any cow that is recumbent when conditions are cold the MIRoTEC Cow Coat helps prevent and treat some of the complications from being down, such as: hypothermia; muscle weakness and pressure damage to the limbs from decreased circulation. Care must be used if the cow’s temperature is raised from disease – ensure the cow is also being treated appropriately for its condition. Calves have low body fat reserves and are susceptible to hypothermia when they are sick. This is especially so in cases of scours where dehydration exacerbates the hypothermia. Hypothermia weakens the calf’s immune system and is an important cause of mortality. Warming the calf is an essential part of treating scours and the MIRoTEC Calf Coat is simple answer but with very effective results. Calves suffering from other diseases, such as pneumonia, often respond better if they are kept warm. The MIRoTEC Calf Coat can also be used preventively for calves exposed to cold weather. Newborn calves have lower colostrum intakes if they are cold. A MIRoTEC Calf Coat helps them off to a better start, under these conditions. Care must be used if the calf’s temperature is raised from disease – Ensure the sick calf is also being treated appropriately for its condition. Utilising “Space Blanket” Technology, MIRoTEC is a microperforated,metallised reflective material laminated to a supportive polyester substrate. When placed against an animal’s body MIRoTEC reflects ‘Infra-Red Radiation’ and by reflecting heat, the blanket boosts blood circulation, whilst at the same time allowing water vapour and moisture to pass through the laminate. The ‘effects’ of reflecting back the animal’s own infra-red radiation are to increase core temperature and local tissue temperature and to cause vasodilation – promoting local circulation. The porous construction of the MIRoTEC allows the escape of water vapour, but do check to ensure that excessive sweating is not taking place. If this occurs the MIRoTEC should only be used for short periods.